Now cover your pot with a tight fitting lid, set your pot on the stove and turn the burner to high. Plan for approximately 6 minutes to bring the pot to boiling. If your stove burners are especially hot or if you have a gas stove, you may want to keep the temperature just a notch from the highest setting so that the eggs don't jostle around unnecessarily while the water heats up. Everytime your eggs collide with each other it increases the likelihood of one cracking. Also, if the water very rapidly comes to a boil, the sudden change of temperature from cold to hot puts additional stress on the shells and can result in eggs splitting open during boiling. Lift the lid and check progress often as the water is heating - don't leave the kitchen at this point, or leave the pot unattended, for safety reasons. 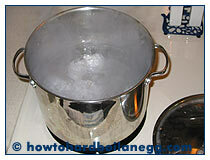 You need to let the water come to a full boil, then take the pot off of the burner and move it to a cold burner. (Don't forget to turn the hot burner off!) Why do we do this? 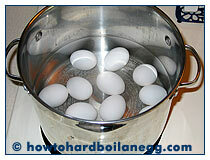 If you allow the eggs to cook in boiling water for several minutes, the egg white will toughen and become rubbery. Egg white solidifies between 140ºF and 149ºF, and the egg yolk will coagulate between 149ºF and 157ºF. This temperature is much lower than the boiling point of water (212ºF). 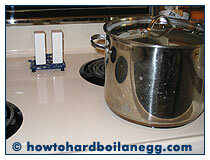 Therefore, you don't need to boil the water hard for an extended duration to cook your eggs. See the picture to your right? As soon as you get large bubbles and steam, take the pot off of the burner and move it to over to a burner that's turned off. Be cautious and use oven gloves since the pot will be hot. After you have moved the pot, add 1 teaspoon of vinegar over the water and eggs. (This will help make your eggs easier to peel.) No stirring is necessary. The peeled eggs will not taste vinegar-y, by the way, so no worries there. Here in this picture, I have taken the pot off of the burner used for cooking, moved it over to a cold burner, covered the pot back up, and am letting the eggs sit in the hot water for 30 minutes to finish cooking. You may wish to set the timer on your stove to remind you to come back for the next step or you may end up doing what I have done on occasion - forgotten about the pot for a couple of hours while I got busy with a phone call or chores. If you do end up leaving the eggs for too long in the hot water, the eggs will tougher and the yolks likely lighter but they are still edible, and you can still move on to peeling them. If you have left the eggs longer than an hour, I would get them peeled and in the refrigerator as soon as possible. Eggs left at room temperature can spoil quickly, especially during the summer months.